AOkay so here we are the day after my visit to the oncologist and we have a plan in place - well mostly!! The day began by dropping the girls off to school then straight to the hospital for my appointment. I was quite glad that it was first thing 9am so I would'nt have to wait in anticipation all day! The reception staff were very friendly and I took a seat to wait for my name to be called!! The chemo unit is tucked away on the second floor of the hospital - and right before it is wait for it - the labour wards!! As B and I were waiting in the oncology unit we could hear these blood curdling screams coming from next door - clearly this soon to be mum wasn't enjoying the experience! I guess I should just count my blessings that the screams weren't coming from within the chemo unit itself!! Before long my name was called and in we went. Our oncologist was a friendly and approachable man - he went through all the pathology results and said we were here to discuss our way forward. He said that to all intents and purposes the breast cancer was gone as the surgery had removed it - the nodes and scans were clear! The downside of this is that there is no way to measure if there are any cells just waiting in the wings ready to burst forth in the future. So in order to reduce the risk in accordance with my pathology - he said chemo, radiotherapy , hormone therapy and possibly herceptin were all the go - yippe the full cocktail!!! There was a delay in the herceptin status so I may not end up needing that but will find out next week!! Having this cocktail reduces the risk significantly so that is the plan. We had also received a letter from immigration medical section wanting more details of the cancer etc so we asked our oncologist if he could fill that out also! Never simple! Anyway we were in there for about an hour and then back out to the desk. I also had an appointment to see one of the nurses for education re the treatment but that wasn't to happen for another 30 minutes! We nipped off to the cafe for a cuppa while we waited. Well actually it was to be while I waited - Brian unfortunately had to go work. So we parted ways and I headed back to the oncology unit once more! The nurse was ready for me and we dissappeared into a side room with chairs and walls and table laden with brochures etc. She said straight away oh are you by yourself - is there noone with you!! I told her my husband had to go to work and wondered what was to follow as she seemed worried I had to hear it alone!! And so the chat began - a detailed discussion on the chemo , side effects etc. I was given special cream for my mouth as I can expect dry mucosa and ulcers , gloves for my hands as they put cold hand packs over theses to reduce risk of peripheral neuropathy, a mountain of brochures and sheets about chemo, nutrition, support . As my friend said cancer is the gift that keeps on giving - sadly these presents arent ones you would hand on to your nearest and dearest! I was given a special card for emergency at the hospital should I experience a fever or being unwell - I will be fast tracked , do not stop and collect $200 , if only it were monopoly!! I was told how my cells will not be up to fighting infection after the chemo and I should avoid people and places with coughs and colds etc!! She asked me if any days were preferable so I said well if at all possible I would like to try and be at my best on the weekends when the girls are home. So we scheduled in the date for next Thursday. I have to have an ECG, bloods and take some meds before starting so she went to get a script from the Dr. I sat alone in the room looking at the wigs and scarfs on faceless stands , surrounded by cancer info and I felt a bit overwhelmed!! She came back in and said that the Dr would prefer to delay the start of treatment to the following week as he wanted to be sure to have the results for the herceptin back before beginning! It will run over 12 weeks and then if herceptin is required that will continue on for a year , alongside hormone tablets for 5 years. The radiotherapy would commence just after the chemo for 5 weeks every day mon - fri. So this will be my next chapter - I am hoping we will be able to have that humdinger of a party before Christmas!!!! The next step of my visit was a look at the area where I would have the chemo. It was a bright room with big windows - but full of medical equipment etc! There were chairs lined up one next to the other without seperation and 2 were occuppied by an elderly man and women - both attached to a drip and I am afraid to say not looking very well or happy. Even when I smiled they gave no response!! I was pretty pleased when it all came to an end and I could leave. 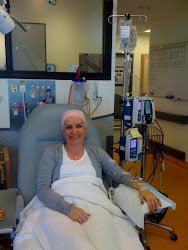 My first chemo day I have to allow 4 hours to get things going - I had to laugh when she told me about having a reaction and not to worry as it was in a controlled environment and they were trained to react in an emergency!! So I was finished - I left armed with all my bumpf and couldnt wait to get out into the sunshine. As I left I walked past the door to the labour ward a couple of young rather nervous looking young men were hanging around outside! I could hear a few more grunts and moans coming from inside - I was just struck by the circle of life and how we are all just on different parts of that journey. And despite where I had just been and what I had just heard I also had such a deep peace in my heart that no matter what I would make it!! !